The last name Vallmitjana is more common than rare in the scientific field. It started the century with a doctor, by mid-century a professor of Histology appeared, and two other last-generation professors, of Biology and Optics, ended the century. But, in the breeding ground of science, there was also a place for Art. Among test tubes, microscopes, and electroacustic inventions, while her relatives were conducting experiments, Imma Vallmitjana started to make drawings. One of the basis of physics is entropy, according to which it could be said, with a poetic license, that universe tends to disorder. 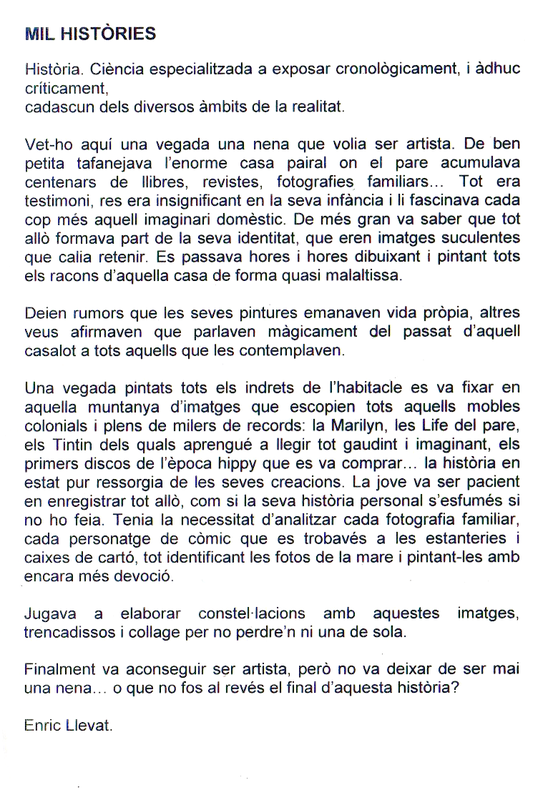 Maybe that’s why Imma Vallmitjana’s fundamental source of inspiration is the rustic house in Torredembarra, a huge mansion built in 1711, with three doors to Major street, where nothing is everywhere, everything is nowhere, and undoubtedly there are still surprises in undiscovered spots. Imma Vallmitjana paints that entropy which becomes beauty in her paintings, where the ordinary chaos is a plastic reproduction of the mythological Chaos. Her canvas are interiors of intimate topographies where her stroke and colour revive what, if painted by others, would only be still life or postcards. In them, thousands of details from reality captured at a glance, but transformed into fiction by the creative denaturalization of art, coexist. Besides her ancestors’ house, Vallmitjana’s paintings reflect other decorations very appreciated in Torredembarra, such as Ramon Lloveras’ printing house and the residence of Manuel Canals, and also a tower in Sarrià which stands in front of the bulldozers’ urban firing squad. In addition, she has started a series about organs, the ones with the tubes, with their carved wood consoles, which possibly require the same steady hand from the painter as from the interpreter that makes them sound. In addition, she paints spaces from special houses on demand for their owners. Imma Vallmitjana has a degree in Art History, she holds an MA in Contemporary Art, Theatre, and Cinema from the Western Maryland College, and holds a diploma in Fashion Design, field where she worked profusely before painting movable privacies. She designed clothing for television, Ovideo ads, and movies, and she worked with Antoni Miró. She was offered to lead the clothing production for the Olympic ceremonies, but she declined the offer because the paintbrush, already tired of an old romance, posed the usual love dilemma: choose me or the other. It seems that the current problem of contemporary art does not lie on its understanding, but in the long-term market crisis. Regarding the understanding and as of such crisis, things of all kinds have been said. 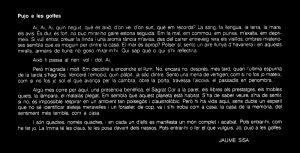 A writer anathematised Josep Beuys in El País journal, and rather than an artist, he called him a sorcerer. A former director of the best museum in this State replied by calling him a reactionary and an outrageous individual. Concerning the crisis, and many times resulting from a poor understanding, Carles Hac Mor wrote in Papers d’Art, with a hint of archliness in his tone, that we have lived in a century marked by creative nihilism, and pointed out the virtues of the crisis as a sieve and that its stubborn continuation turned it into a change. 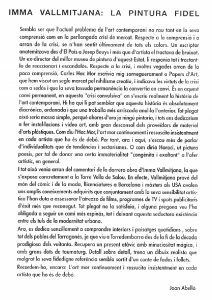 It is in this permanent change, in this “convulsive crisis” where the real contemporary art history is written. Some may thing this history is absolutely diachronic, settled, and that a more daring finding voids the previous one. All in all, that would be too simple, because at this point no one would be painting anymore, and all of us would be making installations and video art, resulting in all plastic art material suppliers grieving. As Hac Mor says, art constantly dies and insistently resurrects inside every real artist. Therefore, here and now, it is more suitable to refer to individualities rather than trends and sectarianism. Or, as Horace would say, ut picture poesis, in order to give a certain “congenital and exciting” immateriality to the artistic issue, in general. 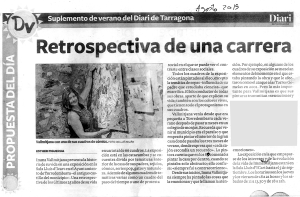 And all this came from the review of the most recent work of Imma Vallmitjana, the one that is exhibited specifically in the Torre Vella in Salou. Actually, Vallmitjana comes from the comic and the fashion universes, her degrees in Barcelona and master degrees in the USA support a wide acquired expertise which, in conjunction with her artistic sensitivity, has allowed her to work as a stage props advisor for films, TV programs, and advertising spots with a success more than renowned. The whole thing did not satisfy her, and certain tedious voice has forced her to take a thornier road, even though that seductive existence remined among the urban modernity tulles. 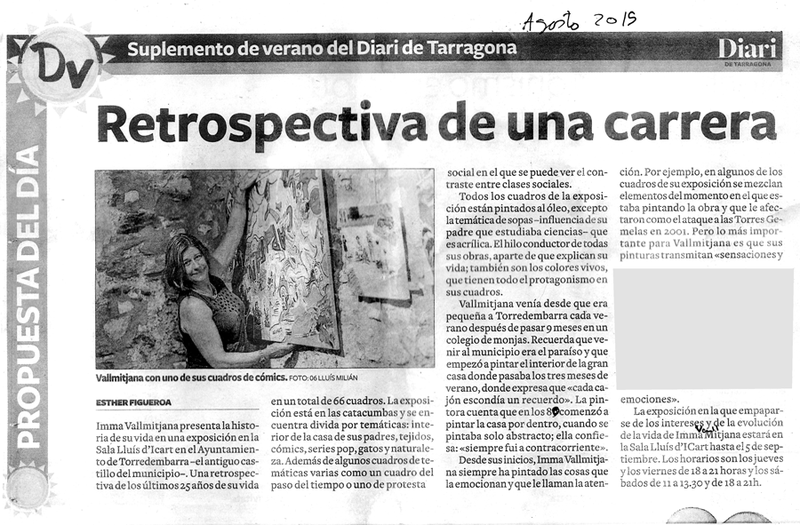 Today, she simply dedicates her time to create interiors and everyday landscapes, especially of the villages in the Tarragonès area, given that she lives in Torredembarra since the end of the prodigious eighties decade. She takes back an atavistic present with a magic thoroughness and remarkable miracle-maker skills. Detail over detail, she braids a realistic drawing that, despite of its reliable reference, looks like something out of a fairy tale. Still, we should remember: art constantly dies and insistently resurrects inside every real artist. Oh, oh, oh, I feel restless, what is it, where does it come from, what does it remind me of? The blood, the tongue, the soil, mum, grandpas. It’s hard, it’s intense, I cannot look at it for long. It hurts, I’m touched by it, it stabs me, it gets me excited, it depresses me. If I want to come in, crossing the threshold and a rancid scent warns me, from de street I glimpse mysterious shadows behind the lace curtains that look like they are moving inside the house. Is the sea close? Perhaps it is, I feel a distant wind of habaneras, and I don’t dare to look myself in these mirrors, these moon wardrobes, who knows what or who will be reflected? This is what is wrong with the kid: he wants to, but he does not dare to. Oh. Someone else is running around, a beneficial presence, the Sacred Heart on the wall, books on the shelves, the furniture still, the lamp, the folded mattress. I think this planet is inhabited. You must see it, you must feel it, otherwise, it is impossible to breathe in such a dusty and claustrophobic atmosphere. But there’s life in here, there’s no doubt a spirit I can’t identify flaps wonders and, suddenly, a stranger finds himself there, like home, the house of memory, of the most horrible feeling, like home. And they are paintings, just paintings, but in each one of them a whole completed world is shown. You can go in as I did. Imma has the keys, she holds them right in front of your face. You can go in or do whatever you like. Me, I’m walking upstairs to the garret. 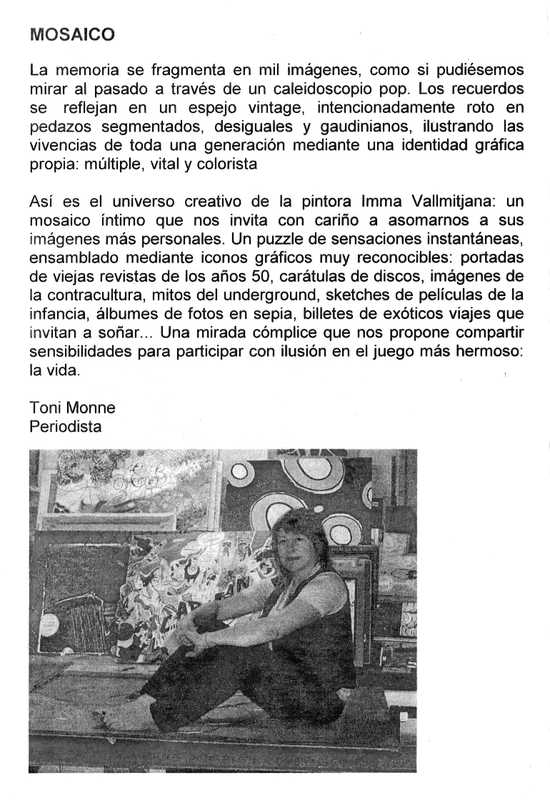 Imma Vallmitjana presents the story of her life in an exhibition in the Sala Lluis d’Icart, in the Town Hall of Torredembarra – the ancient castle of the municipality. It is a backward glance at the last 25 years of her life, in a total of 66 paintings. The exhibition is in the catacombs and is divided into themes: the interior of her parents house, materials, comics, pop series, cats, and nature, apart from various themes, such as the passage of time, or social protest. The latter highlights the contrast between social classes. All the works in the exhibition are oil paintings, except those inspired by microbiology, a result of the influence of her father, who studied Science. The thread which connects all of her works, apart from the story of her life, is that of vivid colours, which have a leading role in all of her paintings. Since she was a child, every summer, Imma would arrive in Torredembarra, after spending 9 months in a school run by nuns. She reminisces that this place was paradise for her, and that she began to paint the inside of the large house where she spent the 3 months of summer, and where every drawer hid a memory. The painter says that she began this activity in the 80s , but only in abstract. “I always went against current fashions,” she confesses. From the beginning, Imma Vallmitjana has always painted the things that excited her, and that attracted attention. 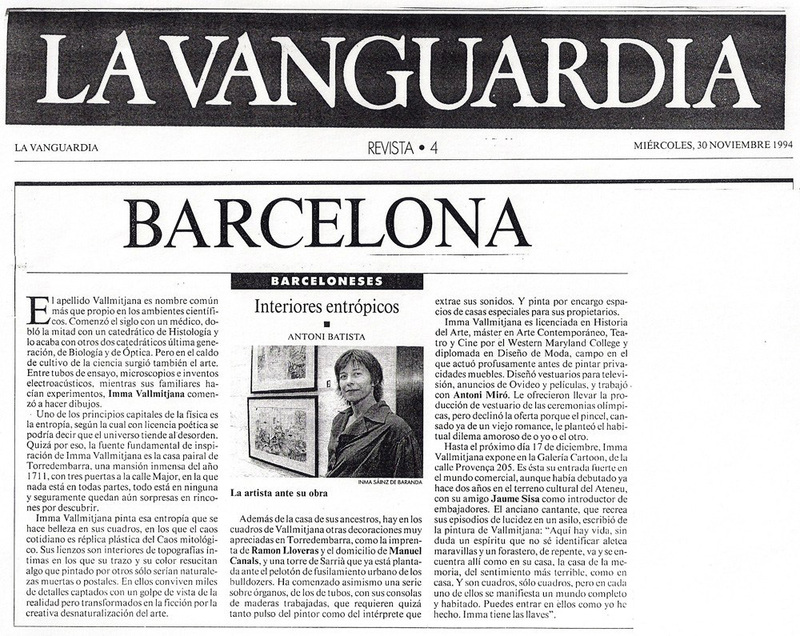 For example, in some of the paintings in her exhibition, she mixes elements of the moment in which she painted the picture, and elements which particularly affected her, such as the attacks on the Twin Towers in 2001. However, the most important thing for Vallmitjana is that her paintings transmit feelings and emotions. 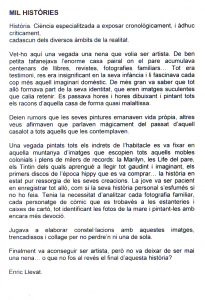 The exhibition, in which Imma gives us an insight into her interests and into the evolution of her life, will be in the Sala Lluís d’Icart, until the 5th September. The memory is broken up into a thousand images, as if looking at the past through a pop kaleidoscope. The reminiscences are reflected in an antique mirror, shattered intentionally into Gaudiesque pieces of all shapes and sizes, illustrating the experiences of an entire generation, through a personal graphic identity; multiple, intense, and colourful. 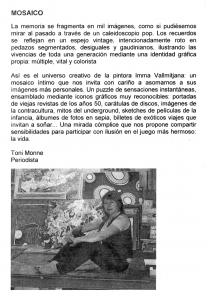 This is the creative universe of the painter, Imma Vallmitjana; an intimate mosaic which she uses to affectionately invite us to peek into her most personal images; a jigsaw puzzle of instantaneous sensations, put together using recognizable graphic icons, old magazine covers from the 50s, vinyl record covers, images of counterculture, myths of the underground, scenes from childhood films, old black and white photographs, tickets from exotic journeys – an invitation to dream. Imma’s work is an invitation to participate eagerly in the most fascinating game of all – life itself. Once upon a time, there was a little girl who wanted to be an artist. From an early age, she explored the enormous ancestral home where her father accumulated hundreds of books, magazines, family photographs and other fascinating things. Everything was important, nothing about this domestic scene was insignificant to her. As she grew up, she came to understand that it all formed part of her personal identity, and that there were succulent images which had to be held onto. She spent hours and hours drawing and painting all the corners of that house which possessed her imagination. Rumour had it that her paintings took on a life of their own. Other voices claimed that they spoke magically of the past of that wonderful house to all those who contemplated them. Once every nook and cranny of this building was painted, she started to focus on the mountain of images and memories that its contents suggested: Marilyn Monroe, her father’s Life magazines, the Tintin books with which she learned to read with enjoyment, letting her imagination run wild, the first records that she bought, during the hippy era…history in its purest form resurfaced in her creations. She played at inventing constellations with these brittle images, in collage so as not to leave any out. Finally, she became an artist, but she never stopped being a little girl…or was it the other way around in the end?